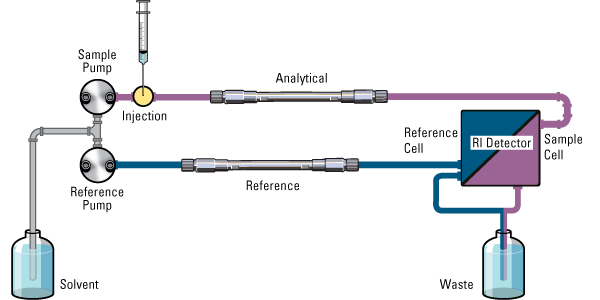 The EcoSEC GPC System has a unique dual flow design which includes the use of two pumps. Figure 1 below demonstrates the flow paths of the sample and reference pumps. The sample pump flows solvent from the solvent reservoir through the following system components in sequence: autosampler, analytical column, sample side of RI detector cell, and waste container. The solvent flows via the reference pump from the solvent reservoir through a reference column, the reference side of the RI detector cell, and then the waste container. The EcoSEC GPC System RI flow cell is constructed in such a way that there are two sides: (1) the reference side, containing a flowing stream of pure solvent; and (2) a sample side, containing a flowing stream of analyte in the same solvent as in the reference side (Figure 2). The unique dual flow design of the EcoSEC GPC System results in superb RI baseline stability and reduced RI baseline drift. 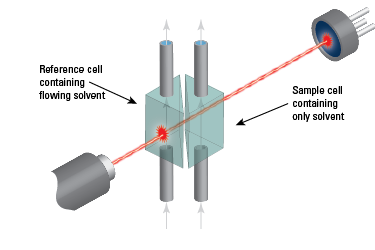 In a conventional RI detector, over time, the refractive index of the stagnant pure solvent in the reference side will slowly change and the two photodiodes will no longer produce equal signals, thus the contents of the reference and sample sides have different refractive indices and will produce a voltage difference similar to that of an analyte in solution. For example, the refractive index of THF slowly alters over time, due to the buildup of peroxide-related compounds, resulting in baseline drift (Figure 3). The dual flow design of the RI detector in the EcoSEC GPC System compensates for the changes in refractive index of the solvent over time by continuously flowing pure solvent through the reference side of the flow cell. Another benefit of the dual flow cell is rapid attainment of baseline stability when the instrument is first started, as purging is not required. 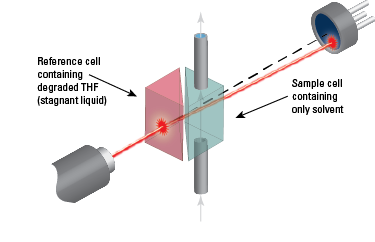 A stable baseline can be achieved by flowing only 50 mL of solvent through the instrument. Additionally, the reference side mobile phase can be sent to waste or recycled back to the solvent bottle.